A while back, I stopped at the factory shop for Fired Earth tiles and just couldn’t resist a little purchase. 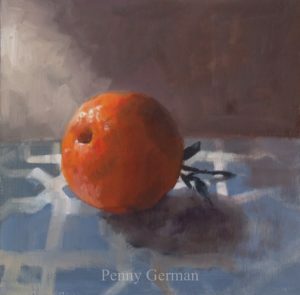 I’ve got a plan to incorporate my new tiles into larger paintings so was just mucking about with this clementine against the smoky blue of the tiles. Back in the studio after a busy day in London yesterday. The ROI pv was great fun and I caught up with a lot of painter friends and made some new ones. I also sold my painting so was quite chuffed. I was hoping to get to Coton Manor for some painting today but the wind was too strong and would have made it a nightmare. Getting ready now for my next exhibition in Hammersmith which starts next Monday at the Hepsibah gallery along with Lesley Dabson. Here’s a little coffee cup for you. Right, I’m off to turn up the thermostat! Ok, ok, but they’re gone now. They went in the Christmas cake last night so no more clementines for a while. I’d like to let you know that whilst my exhibition in Stratford-upon-avon is still running until next Thursday, I have another up my sleeve. I’ll be exhibiting at the Hepsibah Gallery in Hammersmith with Lesley Dabson who is a rather marvellous painter of boats, waves and Venice. We’d love to see you so do pop in if you’re in the area. Off to a very soggy Cumbria tomorrow so will touch base next week. Have a lovely weekend. I’m going to squeeze every last drop out of these clementines so be warned. I have some very exciting news. 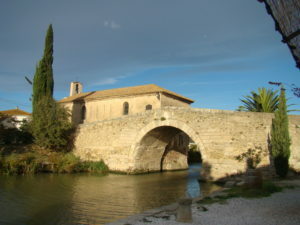 I’ll be running an oil painting holiday from 8th-15th September 2018 at beautiful Le Somail on the Canal du Midi in France. 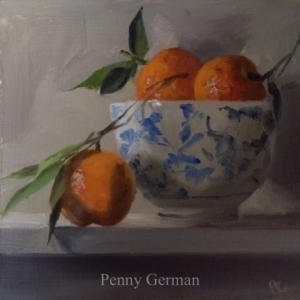 Details are on my website here https://pennygerman.com/alpha-painting-holidays/ and I’ll be giving a 10% ‘earlybird’ discount if you book before April 1st (bookings taken from January). If you’d like to put your name down or receive any more information, do email me. I was thrilled to discover Waitrose are stocking these clementines with the leaves still on. I haven’t painted them with leaves on since leaving Pakistan. Good ol’ Waitrose. I have a few dailies on my ‘available paintings’ page if you’re looking for a lovely Christmas present. Small enough to post too or I could wrap and post for you if you put the correct shipping address on. I also have prints if you’d rather a less expensive gift. Ooops. Went off the radar again there, sorry. Things will be calming down now I hope as my solo exhibition starts tomorrow and everything is ticketyboo……..I hope. If you’d like to pop over for a glass of wine, I’d love to see you. Otherwise – it runs through November so do go and have a butchers. In the meantime, here are some figs for your delectation. Having painted these this morning, I’ve just scoffed two for lunch. Love eating my subject matter! I’m hoping to get to Coton Manor tomorrow as there is some sunshine forecast and the gardens look wonderful at the moment so if you don’t hear from me – I’ll be in the beds with my easel. Enjoy your weekend. Well hello……..I’m back from my long holiday and at the easel again, flying in the face of jetlag and eager to get on. I have to tell you, New England in the fall is all it promises to be despite our missing the best show (it is running later than anticipated this year). What colours. I’ll show you some of the paintings when I get a mo. The second half of the hols was spent with family and I had such fun with little Freya………she’s a real hoot. Anyway, onwards and upwards. I’ve got a lot of exciting things coming up which I will drip feed you with this week but in the meantime, here are some of what’s left in the garden. I think perhaps it will take me yonks to get it into shape for the winter – hoping to get my back into that this weekend.